When a file is written, the data is compressed, encrypted, and the checksum is verified. Then, the data is deduplicated, if possible. Got it. I thought it was the other way for some reason. Thanks for clarifying. Then, the data is deduplicated, if possible. I suspected this based on my testing so far. My next test was to turn off compression… And repeat. I’m betting I see 2-3x dedup ratio vs the 1.11x I have seen now. I just use EXT4 for my home systems. I’ve heard people having dedupe wins with VDI and end user filesystem data. People tend to save the same copies of stuff in their home folders across many users. But yes, dedupe is very much an edge case and unless you know you’re likely to have a lot of duplicate data (e.g., in my case many copies of Windows VMs for testing with) you’re likely better off without it. Even in my case, it’s going to be an experiment rather than 100% expecting a win. imagine a file system that almost no one on the planet would agree is reasonable and then also deliberately reduce the speed of reading files from your disk by making fragmented files? where i can i find this hash table to verify every single block of the iso? and then the hash to verify that hash table thats like 50~100mb? ZFS filesystem code does this transparently. YOU don’t verify anything, it is built into the filesystem. 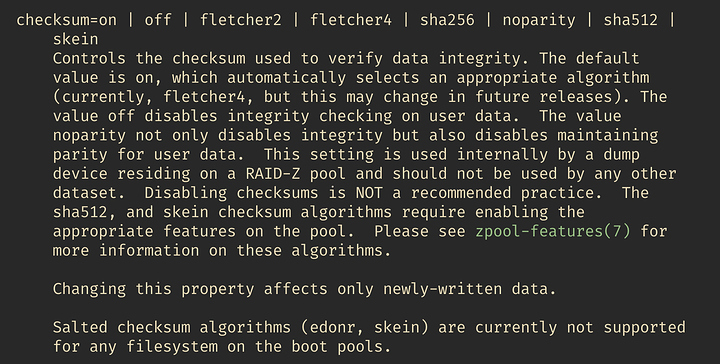 Every block on a ZFS filesystem has a block hash, which is recorded and read when the block is read to verify the block is in-tact. Due to the fact that these hashes are sha256, they are pretty much guaranteed to be unique. As this is the case, any block with the same hash can be considered a duplicate, and thus ZFS uses the same block hashes it uses internally to verify integrity as a duplicate block indication. If you read an ISO from ZFS, you can be guaranteed it will either read correctly (as it was written) or it will not read at all (if it is damaged and sufficient replicas in the filesystem do not exist). I.e., you either get the correct data back, or a hard error. Again, these are not file hashes. But every single block (including the uberblock, of which there are multiple copies) is hashed. If you’re talking about verifying the downloaded ISO, then the download site will have the appropriate checksum/hash file for you to verify against. The reason the block hash table needs so much RAM in ZFS (IF you turn on de-duplication) is because ZFS does de-duplication in-line, at the time the block is written, rather than a scheduled task. The reason for this is ZFS is intended for 24/7 performance, it is a given that there is no “out of business hours” time to do a scheduled de-duplication run, like on say a Netapp or whatever. So, at write time - every block written needs to be looked up in the hash table to see if it already exists. If this table is not in RAM, then it needs to be looked up from disk. As you can imagine, a disk seek to look up the hash every time you write a block will tank performance. Consider using clones. You can set up a windows VM, snapshot the disk, then clone that as many times as you like for free. Already using VM workstation thin clones from (sysprepped) templates, however they tend to diverge as windows updates are applied, and additionally there is likely A HEAP of duplication between say, Windows 2008R2/7, Windows 2012R2, Windows 2016/Win10, etc. I tried dedupe on VMs and didn’t have a good experience, even with a large amount of ram (192GB). Lots of variables though, so maybe it can work. It’s certainly a good case for duplicate blocks so long as the VMs aren’t encrypted and there are a lot of them. I think most likely it’s a case that may be viable in the future when some of the kinks are worked out of dedupe. You can actually choose from several checksumming algorithms. The default is a faster, non-cryptographic hash, though sha-256 is an option. They will diverge over time, yeah. I figured test VMs would be pretty short-lived. One of the practical considerations for VMs is that unless the filesystems in the VMs are tuned for the alignment of the underlying zvol block size (not a typical default), the same data might not be necessarily written in a way that produces matching blocks in the eyes of ZFS. Mostly yeah, but i am pretty slack with updating my sysprep templates, so inevitably i end up with X clones with Y months of updates. Like i said, it will be an experiment. May end up trying it at home first later this week as i think my home PC currently has a spare 500 GB SSD in it (lol, how times change - can’t remember for sure how many SSDs i have) that used to be my Windows 10 install. If not, i know i have a spare 240 gig SSD in a USB caddy i can commandeer for testing. Work i only have the 2 SSDs, so i’d need to wipe out my test environment to convert the second SSD to ZFS. It’s a 4TB pool, I assume one would like to be able to take advantage of at least 1TB of that. Are you talking about just making sure the zvol block size is in line with the block size of the filesystem in the VM (or vice versa)? It amounts to the same thing either way. The block size used by the filesystem in the VM should not be smaller than the block size of the underlying zvol, just like a filesystem on real disk should use an appropriate block size. The motivations are different, but that’s a fairly basic rule of thumb.